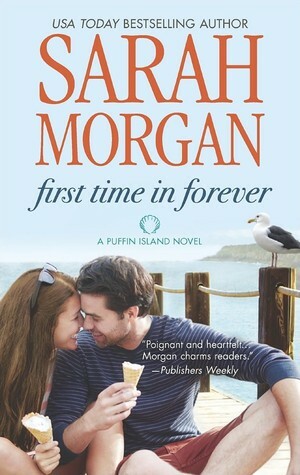 First Time in Forever is the first in her new series set in Maine on a small off the coast place called Puffin Island. I've read a few books recently set around this region and it is fast becoming a place I'd love to visit. The island that Emily arrives at with her small niece Lizzie is a booming summer idyll but not so much in the winter. Fortunately Emily arrives mid summer. Emily has only had Lizzie for a couple of weeks, her half sister has died and has left Lizzie's care to Emily. She and her sister have never been close so this is a surprise to Emily. Now it is important to escape to some remote place because the media want to photograph Lizzie because her mother was in the movie business. Emily has had a difficult upbringing, her mother was an alcoholic and was never there for her. She took on responsibility at a young age and has been haunted by a very unfortunate accident that she feels was her fault. So it is now very difficult for her to love, she holds herself back and doesn't allow herself to get too involved. Will Lizzie change all that? Will Emily manage to give this little girl all she needs? Ryan has been contacted by the owner of the cottage, Brittany, and asked him to keep an eye out for Emily and give her any support she needs. Brittany, Emily and Skylar are very close friends and have often come to Castaway Cottage - where Emily now stays. In the absence often of family support a strong friendship exists between these three. Ryan himself has a background that has led him to once fleeing the island to 'do his own thing and be free'. Now however he is back and owns a successful business on the island. He does take Emily and Lizzie under his wing and helps them out in all kinds of ways. But remember Emily is emotionally challenged and Ryan is responsibility challenged so there are many hiccups along the way. It took me awhile to warm to the characters, but once I did, I enjoyed the ups and downs very much. One of my favorite characters was Agnes the grandmother of Ryan - who just seemed to bond with Lizzie and she also had an adorable little dog that also took to Lizzie. There were a variety of minor characters that I am sure will in their time become the main characters in their own books. As that happens I do hope we keep up with the ones who have already had their time in the sun. My favorite moment in the book was when all the islanders joined together to foil an unwelcome visitor to the island. Small community, strong friendship, family and new beginnings, overcoming past fears, courage and trust and love - all found within the covers of this book. friendship, romance, small island community, adorable dog ... I'm in. I also like getting in on the ground floor of a new series. Nice review Kathryn. Sarah Morgan writes a good small town contemporary romance. I liked her O'Neill brothers series more at this point though. We shall see! A good series in a similar setting is the Bachelors of Blueberry Cove. It makes me want to move there! Elizabeth, yes I've read #2 and #3 in that series and enjoyed it. Yes certainly like to visit there anyway! This sounds like an interesting series. I have to look out for it. So many books vying for our reading attention - sometimes I look at my books and wish I could read faster! And I don't have a little one to chase after. I can love and leave my little grand nephews and nieces! I'm not familiar with this author but this sounds nice. Glad you enjoyed it. Yes exactly, a nice light story. And I did enjoy it.